Me Laureassa olemme juuri sinua varten! Laurea University of Applied Sciences is located on six campuses in Southern Finland: Hyvinkää, Leppävaara, Lohja, Otaniemi, Porvoo and Tikkurila. We educate future professionals in ten Finnish Bachelor’s Degree programmes and six English Bachelor’s Degree programmes. In addition, we offer Master’s degree programmes in Finnish and in English. 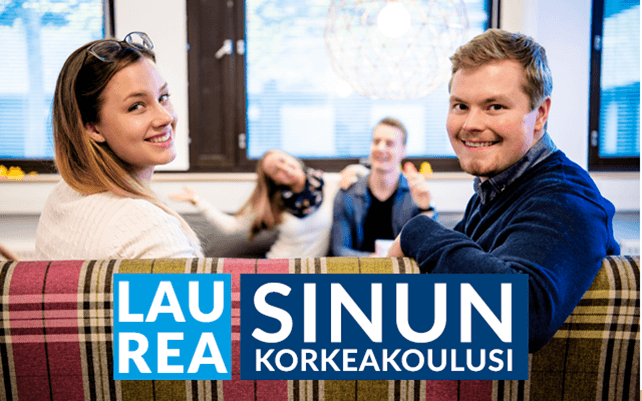 Studying here at Laurea is based on real work life projects, which means that you can network and gain work experience during your studies. Studying is flexible and thanks to our blended learning possibilities and virtual education, you can study when it suits you the best. Blended learning programmes require students to be on campus only a few times a week, which gives you the chance to work during our studies too. As a student of Laurea, you become a part of the Laurea community that consists of 7800 students, 500 faculty members and 22 000 alumni. As a part of our community, you get support, service and help whenever you need it. We’re here for you at Laurea! Löydät lisätietoa Laurean koulutustarjonnasta ja opintojen sisällöstä alla olevasta koulutuslistauksesta. Jokaisen koulutusesittelyn yhteydessä sinulla on mahdollisuus lähettää Laurealle yhteydenottopyyntö ja saada vastauksia opintojen aloittamiseen liittyviin kysymyksiisi. Haluatko tietää lisää oppilaitoksesta Laurea-ammattikorkeakoulu? Täytä yhteystietosi, niin oppilaitos ottaa sinuun yhteyttä.